Unloved are back with their second full-length album 'Heartbreak'. The trio of David Holmes, Keefus Ciancia and vocalist Jade Vincent are set to release the follow-up to 2016's 'Guilty Of Love' on February 1st. The group are inextricably intertwined in a celluloid soundtrack world that cannot help but be atmospheric and evocative. If their songs and music were not about to be, or hadn't already been, included in one or more soundtracks I have no doubt that someone would have developed a screenplay to utilize the possibility. 'Bill', and its preceding track '(SIGH)', are possibly the most moody and evocative pieces on the album. This is where David Holmes and Keefus Ciancia have brought their individual expertise in scoring films or TV shows to bear. The soundtracks that both men have worked on reads like a run-through at a Golden Globes ceremony; 'Hunger', 'The Fall', 'Oceans 11'-13', 'Nashville', 'True Detective' and 'The Hunger Games' to name but a few have been composed by members of the Unloved trio, and it's this experience that has no doubt given these two tracks a particularly cinematic feel. The super slow tempo of 'Bill', its brooding atmosphere and Vincent's sultry vocals conjure up images of Lynch's 'Blue Velvet' as the filmhouse organ plays out below. The ethereal, choral and almost angelic 'Lee' and 'Boy and Girl' are similarly poised and arranged, stretching out notes of deep cello and revolving keys. Angelo Badalamenti and Julee Cruise introduced us to this kind of hypnotic and captivating dream-pop but Unloved have taken that idea and developed it so that as well as fitting a particular mood or moment for a film, it also stands alone on its own merit. The arrangement and performance on 'Boy and Girl' in particular is quite superb. 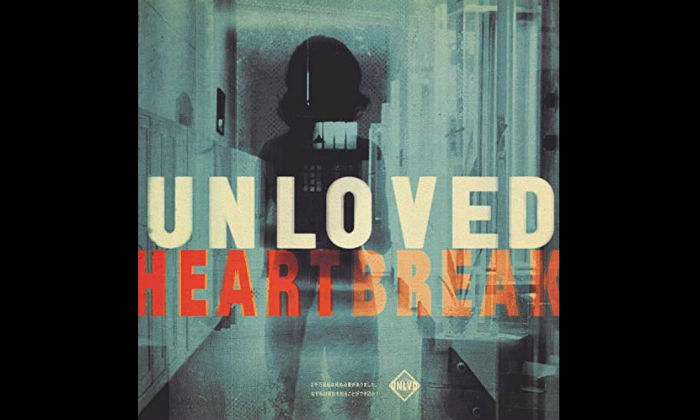 The latest album from Unloved opens with the title track, 'Heartbreak'. Jade Vincent, set to be the voice in Villanelle's head on the next series of 'Killing Eve', pulls off a smoky sixties songstress vocal with aplomb; no wonder then that David Holmes has compared her authenticity to that of the late Amy Winehouse. The 60s vibe prevails throughout with echoes of the classic girl groups of the era. A string-backed soundtrack floats the song as an array of percussive beats drop in and out whilst all the time Jade is reflecting upon why she's so unlucky in love.The layering is quite sublime and the song comes across like a long lost classic just unearthed. 'Remember' has a Morricone meets Tim Burton disposition about it; it's playfully sinister and draws you in to somewhere you're not quite sure of. Is it delightful or disturbing, or just delightfully disturbing? The percussively driven 'Love' blends Pulp Fiction with the best of The Creatures. The drumming here is particularly potent, all 'Kings Of The Wild Frontier', whilst the remainder of the track goes big on the horns and veers brilliantly between garage band scuzziness and sassy smouldering vocals. 'Danger' and 'Crash Boom Bang' up the tempo with a freer, less claustrophobic feel and 'If' closes out the album in a moody magnificence that once again serves to highlight the range and depth in Vincent's most emotive of vocals. As if life were imitating art, Jade made the trip from Arizona to find a pianist to support her jazz room vocals. Well, thankfully, just like Michelle Pfeiffer, Vincent found her Fabulous Baker Boys, or they found her, in the form of first Ciancia and then Holmes. The result of their partnership is to be found, exquisitely wrapped up, in the quite frankly gorgeous new album 'Heartbreak'. Make it the soundtrack to your year, it's a corker.